Featuring quality American Made Products by Buck Stove, Regency & RH Peterson Co. Whether you are looking for an energy-efficient or clean-burning stove, or building an outdoor living room, we can assist you with every need. Gas, wood and pellet stoves and fireplaces, to outdoor kitchen appliances, fire pits and gas logs, we have it all! 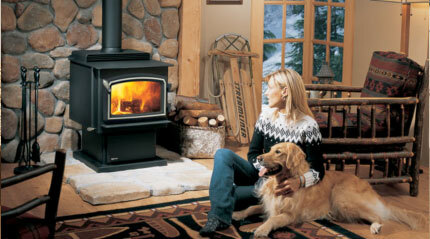 An impressive wood stove providing and amazing wide fire view and up to 80,000 BTU, capable of heating an entire home.